Sometimes teams must take up work that exceeds their capability. Consider a company policy that says ‘The call desk picks up calls within 60 seconds’. This policy forces a call desk team to pick up new calls within 60 seconds. Saying ‘No’ to new work would be a sensible thing to do. But just not in this case. When in such a position what can you do to overcome overburdening and still keep happy customers? In this blog post I’ll show that by looking at the workflow one can discover new options to overcome the overburdening and still not say ‘No’. Alternative ways are described in The Business Support Team Pattern and Help! Too Many Incidents! 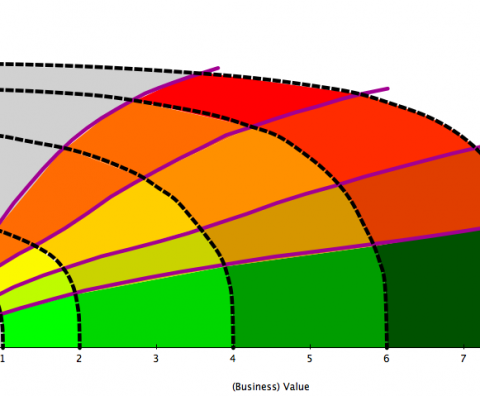 – Capacity Assignment Policy In Agile Teams. More Effective Team With Less Efficient Workers! Methods based on Agile and the Kanban Method both stimulate collaboration to achieve focus and flow. In practice this is often challenged by teams with specialists who have a tendency to maximize the utilization of the specialists. Versnel je team met Scrumban! Herken je dat ook? Teams die meer dan een half jaar aan het scrummen zijn en sprint commitments maar niet halen? Of maar geen stijgende ‘velocity’ laten zien? Blijven verbeteren zonder een echte verbetering te zien? Scrumban is het toepassen van de Kanban Methode in de context van scrum en geeft deze teams een weg hieruit door een structuur en principes te bieden. Various methods exist for helping product owners to decide which backlog item to start first. That this pays off to do so (more or less) right has been shown in blogs of Maurits Rijk and Jeff Sutherland. These approaches to ordering backlog items all assume that items once picked up by the team are finished according to the motto: ‘Stop starting, start finishing‘. An example of a well-known algorithm for ordering is Weighted Shortest Job First (WSJF). For items that may be interrupted, this results not in the best scheduling possible. Items that usually are interrupted by other items include story map slices, (large) epics, themes, Marketable Features and possibly more. In this blog I’ll show what scheduling is more optimal and how it works. Little’s Law is a powerful tool that relates the amount the work a team is doing and the average lead time of each work item. Basically there are two main applications involving either 1) the input rate of work entering the team, or 2) the throughput of work completed. 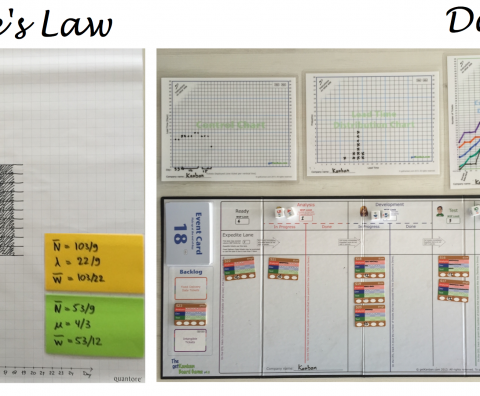 In previous posts (Applying Little’s Law in agile games, Why Little’s law works…always) I already explained that Little’s Law is exact and hardly has any assumptions, other than work entering the team (or system). 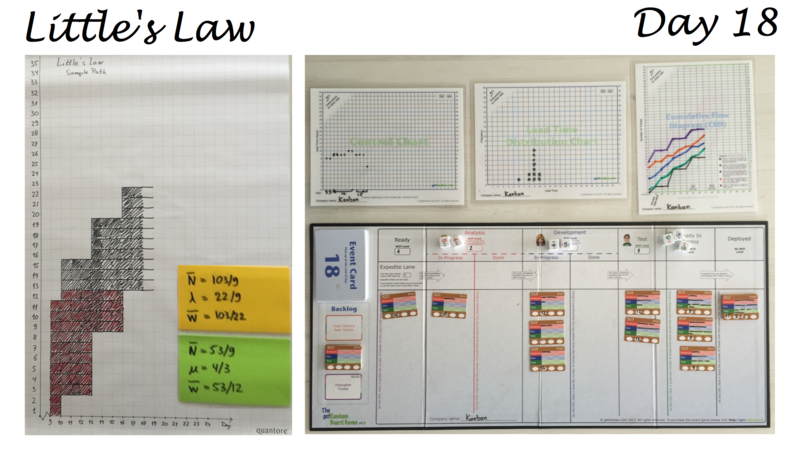 This post demonstrates this by calculating Little Law at every project day while playing GetKanban. 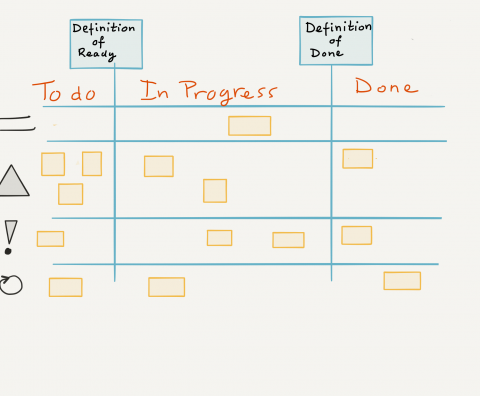 Teams that organize plannable or ad hoc work using Agile methods often exhibit a similar pattern. If they’re usually responsible for operating the application, supporting the business in its use, and/or developing new features on top of a (usually third-party) application, I call them “business support teams.” I’ve noticed that the more ad hoc type of work these teams have to deal with, the more they struggle with a single backlog approach for managing it. In this post, I’ll show you how business support teams such as these can use a particular set-up of boards and agreements to get a handle on their work. 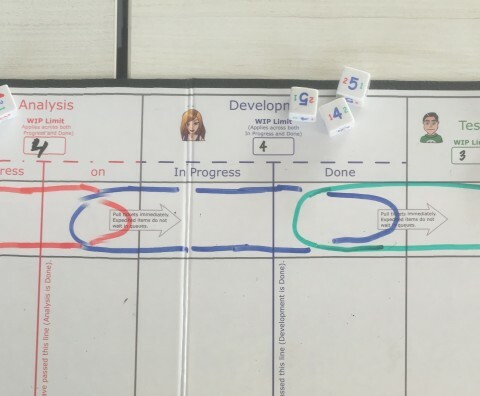 In this post, we play the getKanban Board Game, initially using the standard rules for work in progress (WIP) limits, then, inspired by POLCA, we change the rules. The results show an equal throughput between POLCA and non-overlapping WIP limits, with a smaller inventory size in the case of the POLCA version. First, I provide a short introduction to the getKanban Board Game with a description of the set-up and basic results. Then I provide a brief introduction to POLCA and explain the change of the rules in the game and its set-up using it, then discuss the results. Finally, a few words are spent on the team’s utilization. Inspired by the blog of Mike Cohn [Coh08] “Improving On Traditional Release Burndown Charts” I created a time lapsed version of it. It also nicely demonstrates that forecasts of “What will be finished?” (at a certain time) get better as the project progresses. A team I had been coaching held a sprint review to show what they had achieved and to get feedback from stakeholders. Among these were managers, other teams, enterprise architects, and other interested colleagues. In the past sprint they had built and realized the automation of part of the Continuous Delivery pipeline. This was quite a big achievement for the team. The organization had been struggling for quite some time to get this working, and the team had realized this in a couple of sprints! The team replied with a straightforward answer to this relatively simple question. What just happened and how did the team respond?